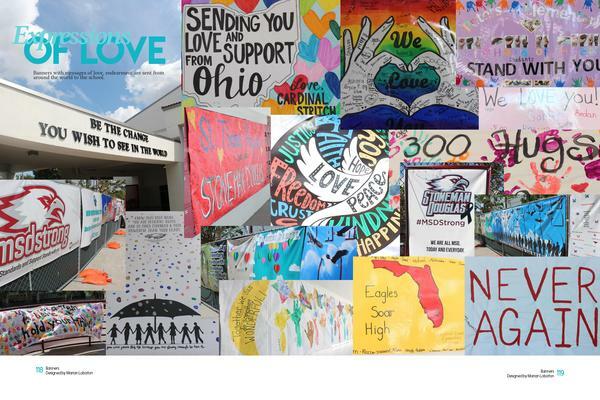 A spread from the 2018 Marjory Stoneman Douglas High School yearbook. 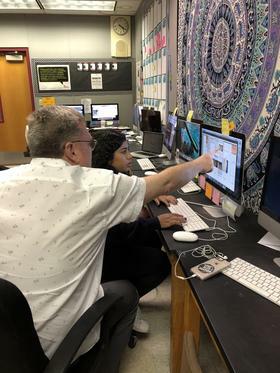 The adviser, Sarah Lerner, told WLRN about her experience helping students redo the book on tight deadline after the shooting. 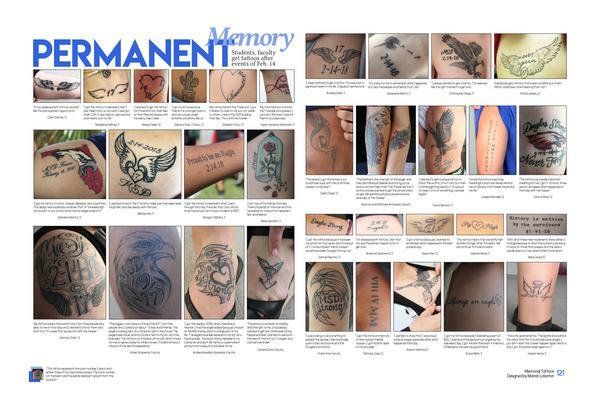 The yearbook included a collage of photos of tattoos people got to remember the 17 victims of the shooting. And she’s nervous. It’s the classroom where she hid with her students during the massacre on Feb. 14. 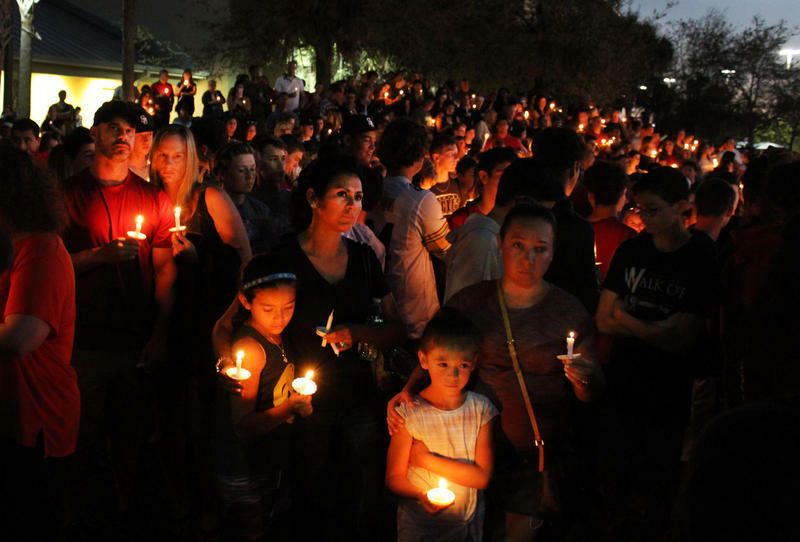 Next Tuesday, August 14, marks six months since the shooting, and Wednesday is the first day of school in Broward County. 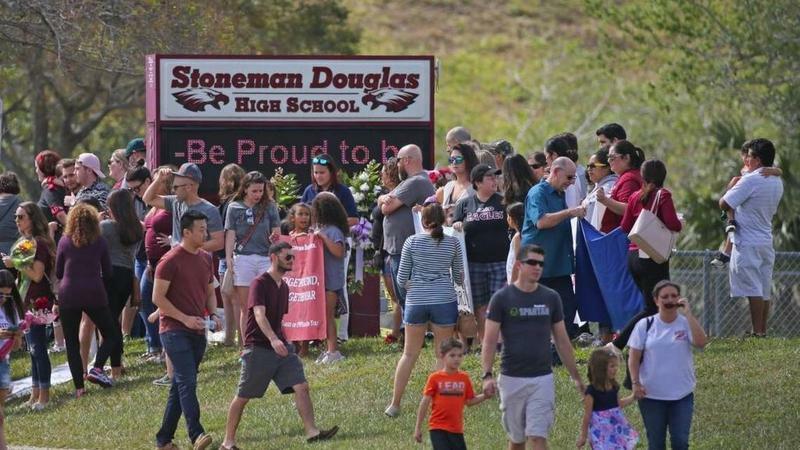 WLRN: You were displaced from your classroom after the shooting. Lerner: I kind of went from this large palatial estate to akin to a studio apartment. But I will be moving back into my classroom for this school year. I get to go home now. When we talked before, you said that when you went back into your classroom, you had a panic attack or an anxiety attack. And now you're going to be going back to that classroom full-time. What are you expecting? In a normal summer, I usually go in a couple of times just to say hello, take care of some odds and ends. I have not been to school since the last day — I have avoided it like the plague. I've tried not to drive past school, because I don't want to see what's popping up — what new security things and fences. And who's sitting out there? Are the news vans camped out front? I just don't want to see it. I went to school today for a little bit for a meeting I had, and I started to feel very anxious as I pulled up to school. I didn't sleep well last night. And I don't know if that's just the initial nerves of being back on campus, or if this is some kind of foreboding look of what's to come. You're the yearbook adviser, and the teacher that you roomed with, Melissa Falkowski, sponsors the school newspaper. Tell me about the process of the students telling the story of what happened to your school through the yearbook and the newspaper. The nice thing about sharing the space with Melissa — we kind of dubbed the room “headquarters” — was that she and I could share our resources. The last thing you want to do is ask a grieving parent to send pictures again or complete this interview again. There was a lot of national attention on the yearbook. 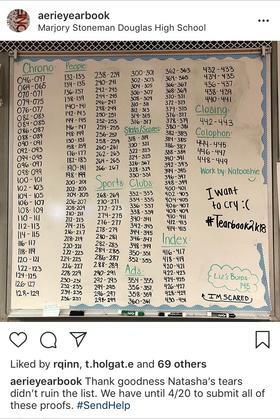 I'm thinking of that story from the New York Times about the students putting the yearbook together and grieving at the same time. What was it like to be on the other side of that? It's always important to use your own voice to tell your story, because nobody can tell it as well as you can. You lived it. I'm very proud of the memorials that the students did. I'm incredibly proud of the 14 pages of coverage about the events and the things that happened after. Every year — and any yearbook adviser can tell you — you hate the book you're working on. You are so sick of looking at it. “I swear, if I look at this book one more time, I'm going to scream.” And I feel that way about every book I have made, except this one. How many yearbooks have you overseen? This one was my fourth. I just ... I love this book. The hard work and the heartache and everything that went into finishing it. It just consumed me. What is your favorite page in the yearbook? When the fire alarm went off [on Feb. 14], I was working on the Special Olympics spread. And when I came back two weeks later, my desktop computer was still on, and that spread was still up. When I saw it in print, it just kind of took my breath away a little. Because you remember certain moments of your life very clearly, very vividly. You recently tweeted: "Raise your hand if you're anxious about going back to school," with an emoji of a woman raising her hand. I guess that's you. That is me. There are so many unknowns. You know, when I'm back in the room with [students], how am I going to be? Because, they are new kids this year. The incoming freshmen — they weren't on campus last year. Are they going to understand when Mrs. Lerner's not having the best day? Yes, the ones who call you mom. You know, it's funny, they all call me mom. My daughter — she's 9, and she was a little more clingy after everything, which is understandable. My son told me the other day he's a little nervous to go back to school, and I don't think it's the seventh-grade jitters. My son was in middle school at [Westglades], the school next door. He's concerned about school safety for him and for me. You know, is my mom safe when she goes to school? I can't guarantee that something like this will never happen to me, to us, again. But I'm fairly certain that it won't. Is there anything that you would want parents to know about how they can help their kids? Listen to them. If they're in therapy, and they don't really care for the person they're seeing, let them see someone else. If they aren't going at all, and they want to, take them somewhere. I'm so thankful that this mental health piece is so prevalent now and in the conversations. Before, we also talked about how you might not get to every book or play you planned to read with the students last year. How was the rest of the year academically? So, the day of the incident, I was giving a quiz on book one of “1984.” We did not finish reading it, which upset me, but I couldn't expect them to sit there and listen to Winston Smith's story when they had so much other stuff going on in their heads. After “1984,” I had planned to teach “Macbeth.” Can't do that — everybody dies. It's not by gunshot, but everybody dies. So how do I teach that story? So, I did a lot of creative writing and a lot of, you know, hippy dippy, feelings stuff. And some of them were into it, and some of them weren't. Have you changed this year's curriculum in any way? My journalism class … will change a little. Covering a news story, and what's being invasive and intrusive, and where is a safe distance, and, you know, just things like that — are really important. The kids have strong opinions about that, and so do I.